That blast of wind you might have felt coming out of the north on Wednesday morning was not a polar vortex or other global climate event. It was just me, heaving a sigh of relief at the news that Jose Ramirez is OK and will start the year on CLE's active roster. You might have missed the news if your monastery’s satellite TV was out of commission, but Ramirez, one of the finest fantasy baseball assets this side of Mike Trout, was hurt in a freak injury on Sunday. He was at the circus when he was bitten by the two-headed monkey. No, that’s a corny old joke from my childhood. But the injury was freakish. Ramirez fouled a ball weirdly straight into his left knee. He fell to the ground making an awkward twist like a battlefield extra in Saving Private Ryan. He was taken off the field on one of those carts that always seem to arrive as promptly as a City of London bus (for those who haven’t enjoyed the pleasures of London’s buses: not that prompt). My immediate concern, like zillions of other fantasy players, was that I own Ramirez in two of the three leagues I’m playing this year. If Ramirez were to be out for months, I’d be toast before Opening Day, a good two weeks earlier than usual. Anyhow, the diagnosis was a "contusion," which is what your doctor calls a bruise when he needs to pay for a new yacht. Ramirez’ knees were actually in way better shape than mine, partly because I spent most of my adolescence playing contact sports, and mostly because I spent most of the last two days on them, praying for Ramirez’s recovery. My prayers were answered! Which made me think right away that I should have prayed for my numbers in this Friday’s Lotto Max. Cleveland sent Ramirez for workouts and assessment in Phoenix, and it went well enough manager Terry Francona announced that Ramirez would be with the team for a Wednesday workout in Minneapolis, and he was in the lineup when the team opened its 2019 season against the Twins. Knuckleballer Steve Sparks took himself out of the 1994 MIL rotation when he tried to emulate some motivational speakers by tearing a phone book in half. He popped his left shoulder out of its socket. In 1997, Robin Ventura slid aggressively into home and his cleats caught on the side of the plate. He broke his ankle and missed four months. In 1978, MIL catcher Ray Fosse, who had any number of weird injuries in his career, was chasing a flyball up the first-base line, stepped into a hole, and tore a knee ligament. He missed the entire season. In 2000, ARI 3B Matt Williams fouled a spring training pitch off his foot, breaking bones and costing him more than 40 games. In 2015, TOR OF Michael Saunders was chasing a fly ball when he stepped on a sprinkler, tearing the meniscus of his left knee. He was out until after the all-star break. In 2015, then-CHW pitcher Chris Sale broke his right foot jumping out of his pickup truck. He was unloading stuff as part of a move. You’d think he could afford professional movers. And this year, Dodgers reliever Joe Kelly hurt his back cooking a Cajun feast for his new teammates. This spring has also seen its share of serious injuries. 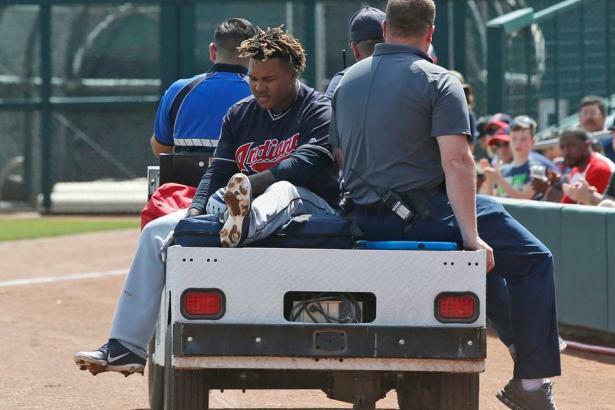 Ramirez's teammate Francisco Lindor hurt his calf early on, and wasn't back by Opening Day. Scooter Gennett lost his footing fielding a ground ball in short right field, and strained his right groin. He’ll be out two to three months. And the cruel vagaries of fate really colluded against ARI OF Steven Souza Jr. On Monday night, Souza slipped awkwardly while crossing home plate, and when his left leg jammed into the ground, the force tore three of his knee ligaments. Unlike Ramirez, the injury was extremely dire, and he’ll out for the year. Luckily, there’s a bright side. After Souza’s injury, the Diamondbacks announced that Adam Jones would be taking over as the everyday right fielder. And guess who drafted Adam Jones late? Oh, yes. My prayers have been answered again! I should get over to the chapel. Or the lottery kiosk.